The streets from Basantapur to Jyatha were alive and throbbing with anticipation for the Pulukishi to come hurtling down the narrow stone paved streets like it had done for centuries during this time of the year. Something stirred at the far end of the street perpendicular to Jyatha Temple and the commotion neared as the people crowding the streets scampered to clear the way. You could feel the adrenaline in the atmosphere as the already loud gathering at the chowk grew even more agitated with enthusiasm. It wasn’t long before a white body impersonating the celestial vehicle of Lord Indra sped rampantly through the street. Watching the chariots of Lord Ganesh, Kumar and Kumari is also a popular sight during this festival. The chariots are led by frenetic men with bright red vermillion across their foreheads and a black Dhaka topi standing atop the chariots and commanding the men to pull. Energized and inebriated men obey and heave the massive chariots. These are just parts of one of the most celebrated festivals of the culturally rich city of Kathmandu: the Indra Jatra. 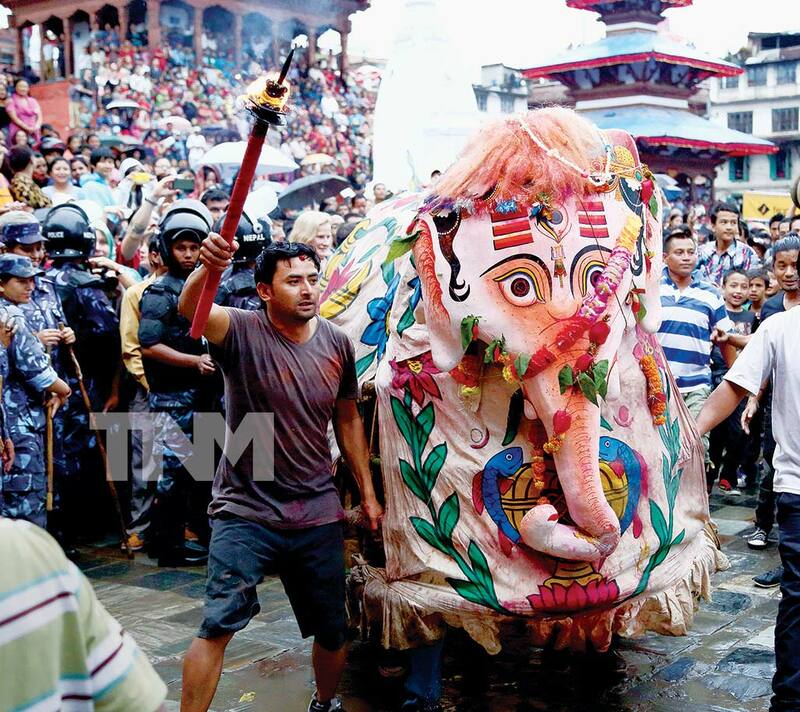 Indra Jatra is one of the most anticipated festivals in Kathmandu and has an unorthodox story behind it. For a nation that holds such a revered status for their gods, celebrating the capture of a god for stealing is indeed peculiar. As the story goes, Lord Indra descended onto earth from heaven disguised as a common man to get the Parijat ( Jasmine) flower, which was only available on earth, to treat his dying mother, Dakini his mother. While doing the deed, the disguised Lord Indra was caught by the locals and accused of stealing flowers, and as per the law had to be punished accordingly. Because he was caught and bound, Lord Indra was unable to reveal his true identity and the locals were not too keen to believe his story. Indra was tied to a pole and put on display at various places in the city for eight consecutive days. It wasn’t until Lord Indra’s mother herself came down to earth and pleaded for the release of her son, that the locals realized that the “thief” was in fact Lord Indra himself. The locals promptly released him and Dakini then promised the residents a boon. The people, content with their lives under their king, only demanded regular rain in Kathmandu. Indra then went back with his mother and locals began to celebrate the eight days of Indra’s punishment as Indra Jatra, honouring the king of heaven. Back to present day Nepal, festival starts with Yosin Thanegu, the erection of Yosin or Linga, a pole from which the banner of Indra is unfurled, at Kathmandu Durbar Square. The pole, a tree shorn of its branches and stripped of its bark, is obtained from a forest near Nãlã, a small town 29 km to the east of Kathmandu. The pole symbolizes the capture and of Lord Indra. Indra Jatra also hosts the rare display of the deity Akash Vairab, which is believed to represent the head of the first Kirat King Yalamber. During the festival, devotees flock to the massive mask to obtain the concoction of several offerings of jaad and raksi from devotees spouting from the structure as it is believed to be a much sought after religious offering (Prasad). The chariot procession begins three days after the starting of the Jatra. On the first day, the chariot is taken from Basantapur to Jaisedeval, Lagan, Bramha Tole, Bhimsen Than and back to Basantapur. On the second day, the chariot is led along Basantapur, Ittkha, Nara Devi, Tengal, Baangemudha, Asan, Indrachowk and back to Basantapur. Following a two-day break after that, the chariot will be taken to Mahankal from Basantapur and then back to Hanumandhoka for the conclusion of the festival. Apart from the statues of lord Indra, the chariot is also blessed by the living goddess Kumari, who travels in the chariot as devotees pull it along designated routes. A COLLECTION OF SO MANY PEOPLE IN ONE PLACE IS ALWAYS A POTENTIAL BREEDING GROUND FOR BAD BLOOD. 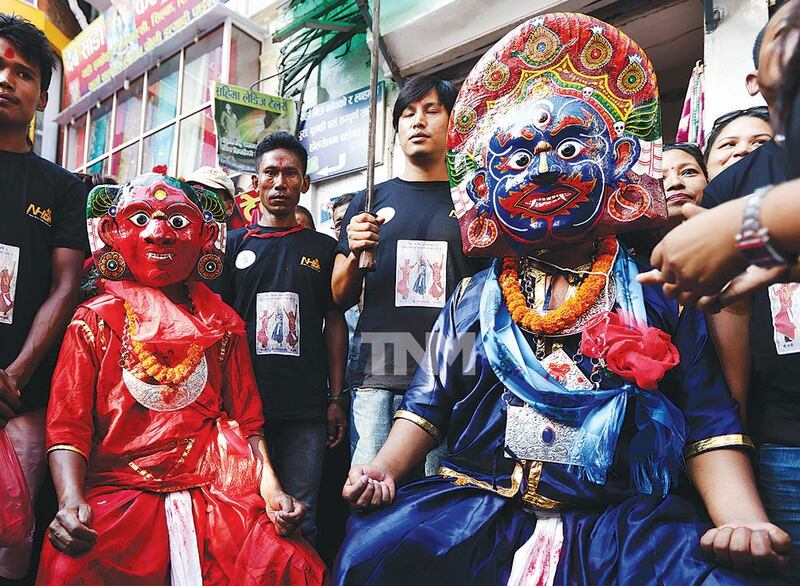 Indra Jatra is also the festival where people get to receive blessings from the living Goddess Kumari. The festivities are concluded on the eighth day with ceremonies like the Laakhey dance and the Pulukishi procession. Although the festivities have a colorful and lively ambiance, the atmosphere has always been marred by the fear of fights breaking out. A collection of so many people in one place is always a potential breeding ground for bad blood or an arena to for men (and women) who have a score to settle with each other. So, it isn’t uncommon for people to be wary during the festivities. Last year’s Jatra held a couple of stories of brutal fights, some even resulting in fatalities and one disturbing video that even made on Youtube. Luckily, there don’t seem to be any news of serious violent breakouts this year. The fact that the violence has been accepted as part of the cultural norm is difficult to comprehend, but it is heartening to see that it is subsiding to some extent.